1.‘What is the Apple IIGS’ is a backup site. Its principle service is to provide working copies of software that were once commercially available but are now no longer widely available due to their age. The majority of the software contained in the archive is commonly known as ‘Abandonware’ although the term carries no legal clearance to obtaining this software. Anyone who downloads software from this site is only legally entitled to do so if you have already bought a legal copy of that software (excepting that some of the software available on this site has been reclassified freeware or was already available as shareware or freeware). It is the responsibility of the individual to check whether the software they download from this archive was already legally purchased. 2. If an individual or company owns the rights to continue selling a software title, or the software developer themself has an issue with a software title being made available freely for download on this site, they are welcome to message me and request that the archive be removed. The page itself, containing information regarding the title, will remain and if the objector would like, a link will be made to where the software can be legally obtained. 3. Software that is relatively new or still being actively developed and sold will not include a disk image archive. Instead a link will be made to that software, but the page will include relevant information about that program. 4. Efforts have been made and are still being made by individuals to persuade software publishers and developers to reclassify their software as freeware so that it can be copied legally. In the meantime, it is important to archive Apple IIGS software as we stand a good chance of losing cherished software forever if we don’t, as floppy disks fail and hard drives die over the years. While this site contains ‘Abandonware’ it is committed to honouring the hard work of the people who developed for the Apple IIGS, by including disk archives, screen shots, packaging scans and descriptions of all commercially available software and hardware for the platform. 5. If factual errors occur within the information for any given software or hardware description, email in with your corrections. 6. The site itself has been designed to be viewed by modern computers with modern web browsers. 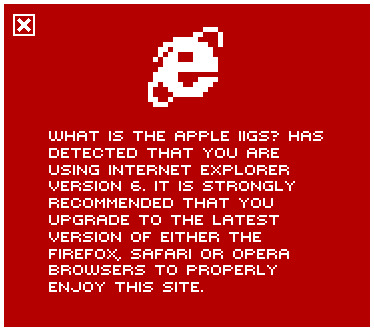 The site hasn’t been checked for compatibility for use on the Spectrum Internet Suite or any other means of web browsing on the Apple IIGS. Sorry about that!